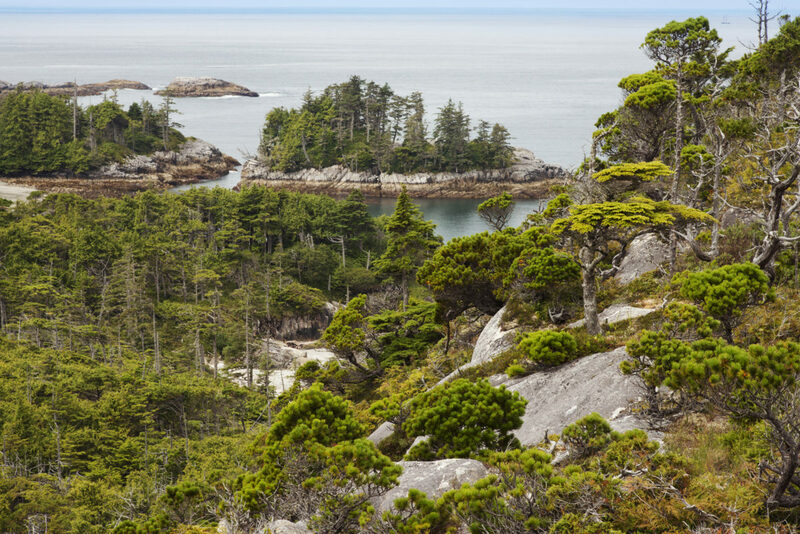 Photos of a lesser-known ecosystem, from British Columbia’s outer coast. Congratulations to Shanna Baker on winning the gold award for Best Photojournalism from the 2017 Canadian Online Publishing Awards for this story. British Columbia’s wild west coast is generally represented as a place of luxurious forests starring gargantuan Sitka spruce, western hemlock, and western red cedar looming over dense, leafy green understory. Yet there is another, drastically different, side to the coastal temperate rainforest that few people know—a landscape where the trees are gnarled and stunted like bonsai, the ground is carpeted in hillocks of multicolored mosses, the stagnant pools are as red as bourbon, and plants slurp bugs for breakfast. This is the secret world of The Bog. The islands and low-slung mainland areas of the coastal belt stretching from the western and northern fringes of Vancouver Island to Southeast Alaska, including parts of Haida Gwaii, have the perfect formula for bogs: lots of precipitation (roughly two to four meters of rain a year); plenty of fog to limit evapotranspiration; steady, year-round temperatures that average a cool 7° C; terrain that’s more undulating than mountainous; and mineral-poor bedrock. In the wettest zones—the “hypermaritime”—bogs occupy just as much or more territory than so-called productive forests. “In fact [bog] sort of characterizes the outer coast,” says independent forest and wetland ecologist Allen Banner, formerly of the BC Forest Service. 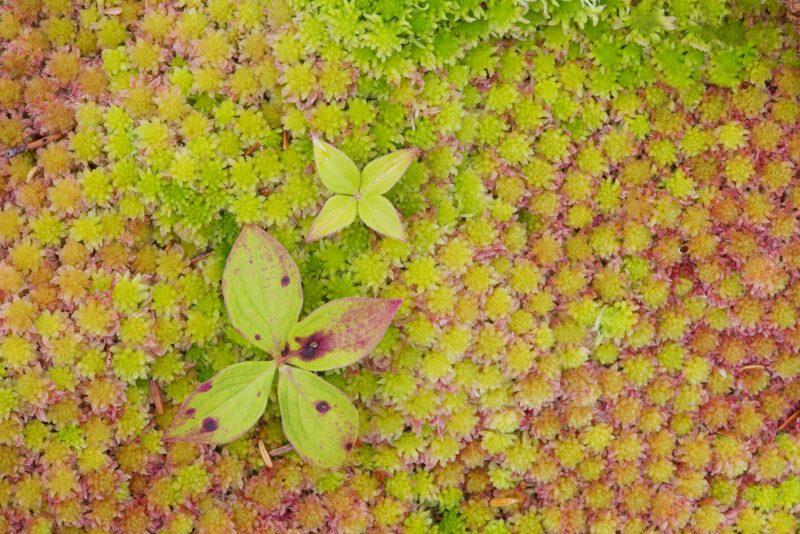 Many of the region’s bogs—more precisely categorized as bog forest, bog woodland, blanket bog, or so on—match the classic description: they’re acidic, mineral-deprived wetlands dominated by sphagnum mosses. What they lack in above-ground grandeur, they make up for with an important subsurface service—stashing away large quantities of carbon from plant matter as peat. In some places, peat deposits can be more than four meters deep. Yet the region also has a unique quasi-bog form common along the exposed outer coast that perplexed the provincial ecologists tasked with categorizing it years ago. These “shallow minerotrophic” bogs look more like meager patches of stunted grass at first glance, yet they actually contain many of the same plants and function similarly to typical bogs, though are dominated by sedge, rather than sphagnum and—in blatant contradiction to the standard definition of “bog”—have access to minerals. Rather than pile up deep reserves of soggy sphagnum peat, they form only a thin crust of soil over the bedrock. In these wannabe bogs, erosion whisks away most of the decomposed plant material that would otherwise accumulate, explains Banner. Bogs here are also remarkable because of the unique mix of species they host. 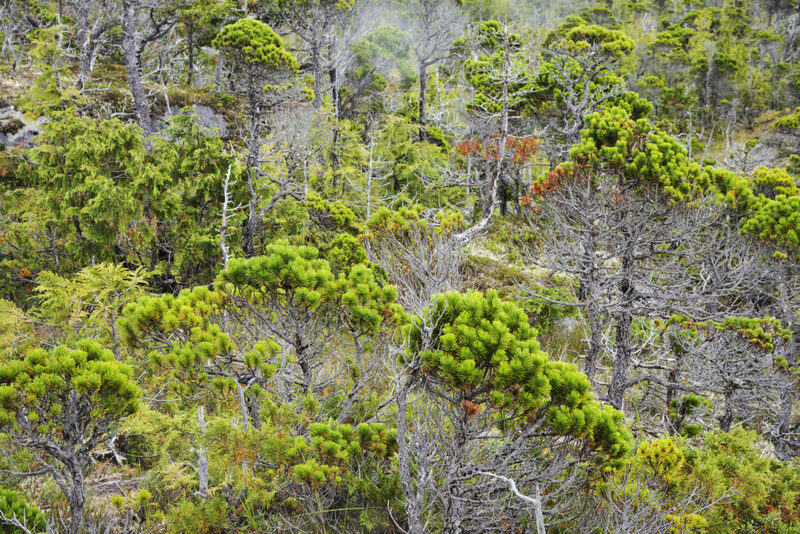 In addition to the standard bog plants such as Labrador tea, sphagnum mosses, and bog cranberry, they’re home to forest species including cedars, hemlocks, and shore pine in the form of stunted shrubs. “There’s no other parts of the world where you get those species mixed in with more typical bog species,” says Banner. 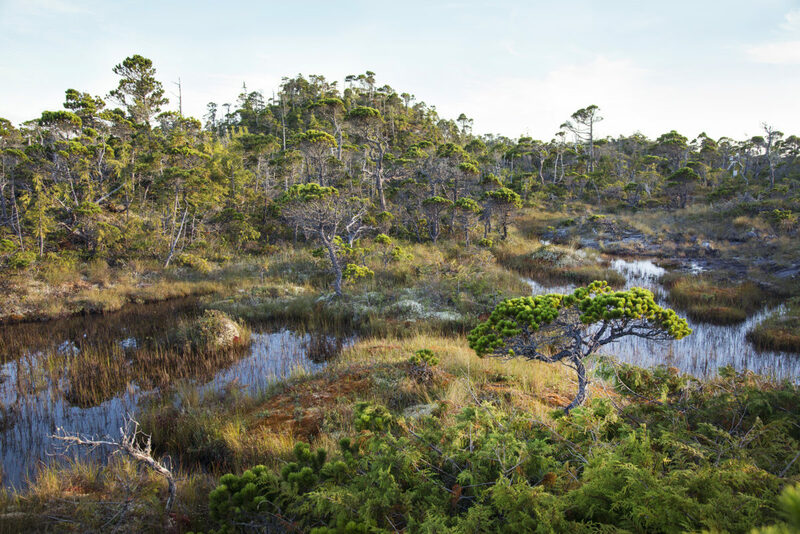 Others are considering how plant communities in the bog may evolve as temperatures rise, whether a bog’s response to discrete disturbance may predict its demise, and how anthropogenic fire has influenced the bogs. 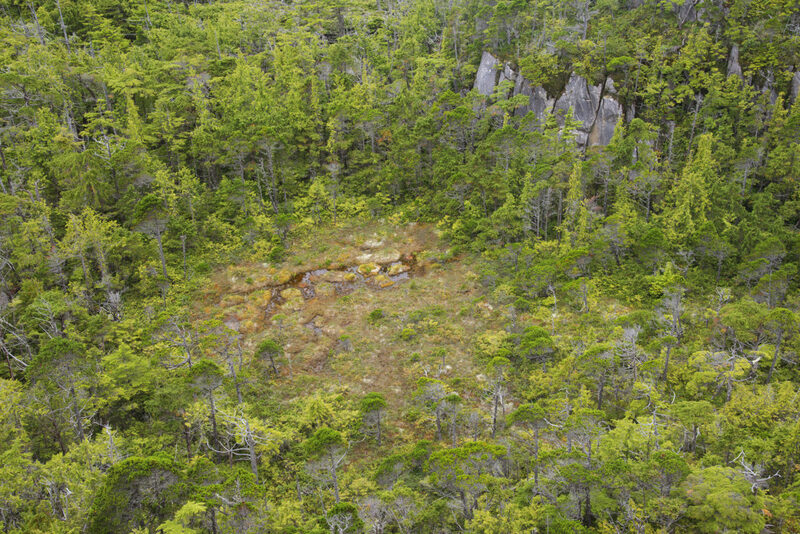 Bogs on Calvert Island have been developing for more than 10,000 years, since the last glaciation, and it’s believed they’re now mostly in equilibrium, says Banner, though they are always somewhat in flux, especially in transitional areas where forest gives way to bog. Long-lasting as they are, bogs are also sensitive. 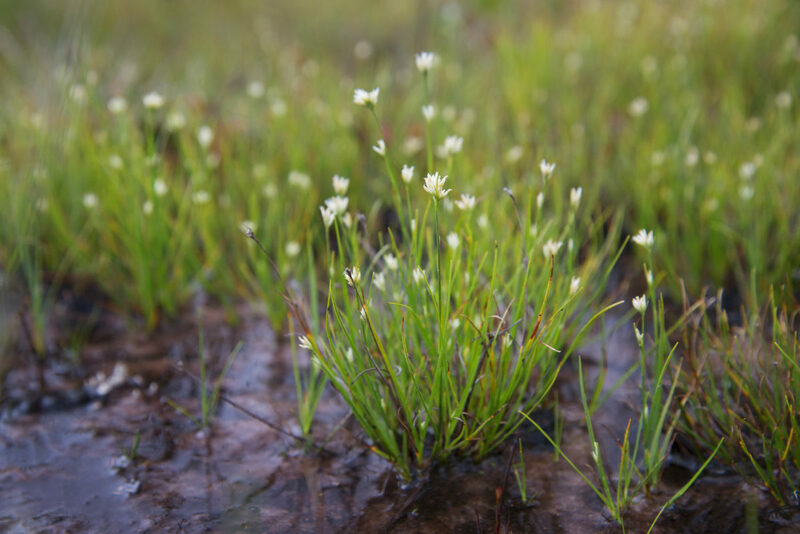 Delicate, slow-growing bog species are easily crushed and can take a very long time to recover; and a sudden change in hydrology because of a trail, road, or construction project, for example, can quickly desiccate a bog and condemn it to a forested future. Here’s a snapshot in time of the other, lesser-known, side of the coastal temperate rainforest. 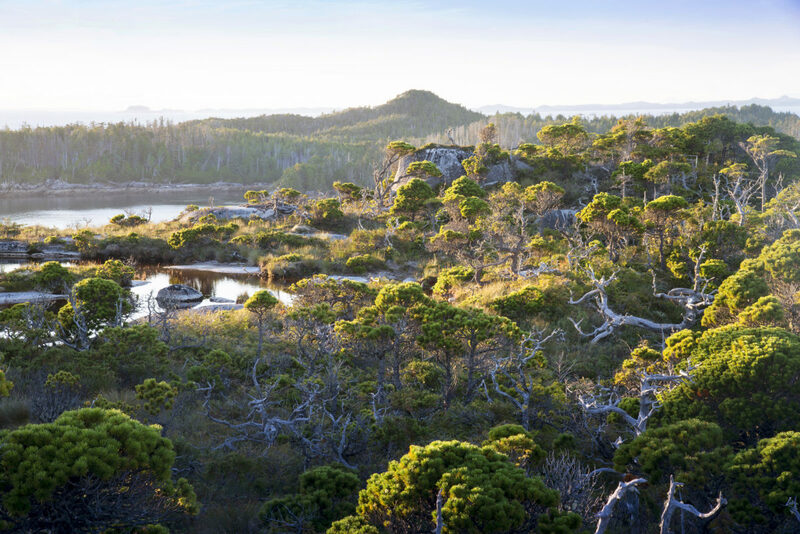 Bogs and bog forests stretch over roughly half of the 374-square-kilometer Calvert Island-Hecate Island complex. To the untrained eye, open bogs might be mistaken for clear-cuts, though no industrial logging has taken place here. 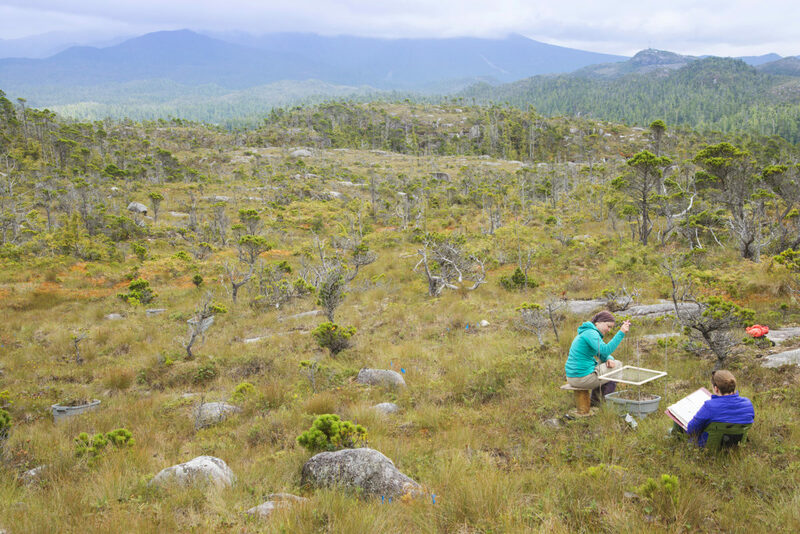 That’s not to say that humans haven’t influenced bogs: new research by PhD candidate and ecologist Kira Hoffman shows that First Nations may have used fire as a tool for resource management in bogs and forests surrounding village sites for hundreds of years. It’s likely people used fire to spur the growth of important food plants, such as huckleberry, salmonberry, and bracken fern, she explains, and to clear land, which kept the forest open and increased fodder for deer and other game. 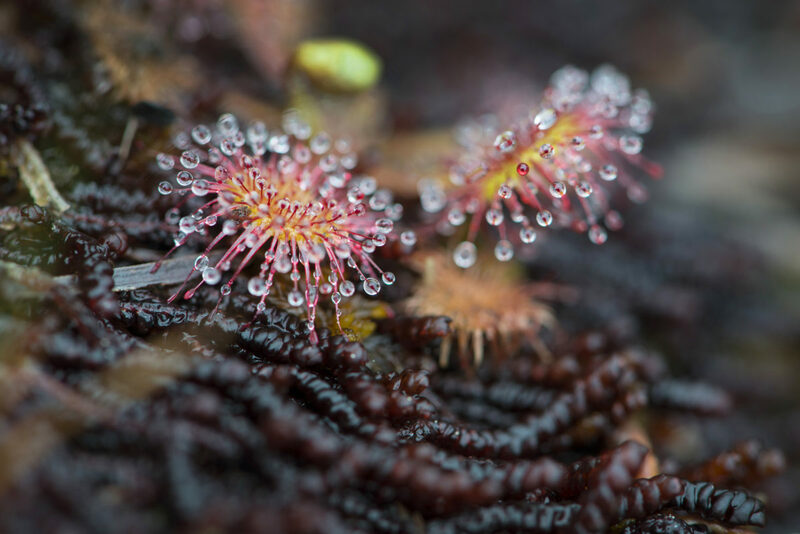 Nutrients are hard to come by in the bog, but tiny sundews, which grow no more than 25 centimeters tall, have a special trick—they feed on insects. They release a sticky substance and the bugs that stumble into it either die from asphyxiation or exhaustion from struggling to get out. The plant then releases digestive enzymes and slowly consumes the meal. Calvert Island is home to three types of carnivorous plants: the round-leaved sundew shown here, as well as the great sundew and the common butterwort. 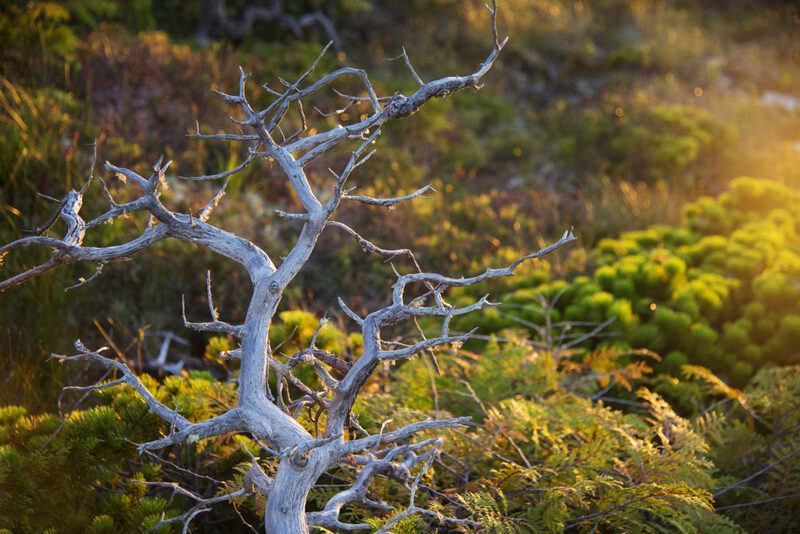 As one scientist puts it, “The bog is beautiful, but you have to look up close.” The crowberry shown here, with its green sprigs nestled against the sculpture-like remains of an old tree stump, is a hydrophyte—a type of plant adapted to survive in waterlogged soils. Though, as forest ecologist Andy MacKinnon points out, crowberry can also grow in non-bog habitat in subalpine, alpine, boreal, and Arctic regions. “The ocean can be a nutrient wasteland—like a desert in terms of nutrient availability,” explains Allison Oliver. When carbon and associated nutrients from the land pulse into the marine environment, they “can be really useful for metabolic processes.” Oliver and her colleagues have data to suggest that at least some bog carbon that washes into the ocean is being directly incorporated into the food web, either through microbial uptake or from direct consumption by zooplankton. Water containing a lot of carbon appears tannic, like tea, explains Allison Oliver. 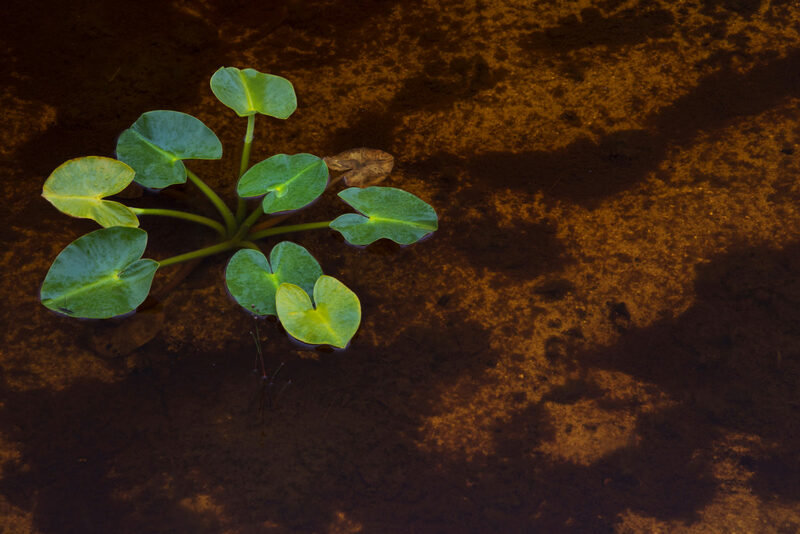 In freshwater pools and streams, tiny organic molecules originating from plants and soils can absorb light. 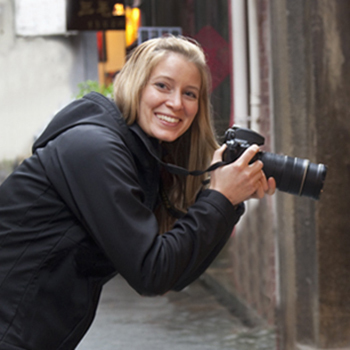 “It ends up being kind of like a sunscreen for the aquatic environment,” she says. “UV rays get absorbed by that stuff, so it sort of protects the creatures that live in there.” The same type of shading effect may occur along the coast when carbon-rich water enters the ocean. Sphagnum mosses, explains ecologist Ian Giesbrecht, are “ecosystem engineers.” They lower the pH of soil, limit nutrient availability by actively removing minerals from the soil and exchanging them with hydrogen ions, raise the water table, and keep the top tier of soil soggy throughout the growing season—all of which makes it much more difficult for trees to survive. The acidic, wet, anoxic conditions also slow decomposition, leading to greater peat accumulation. 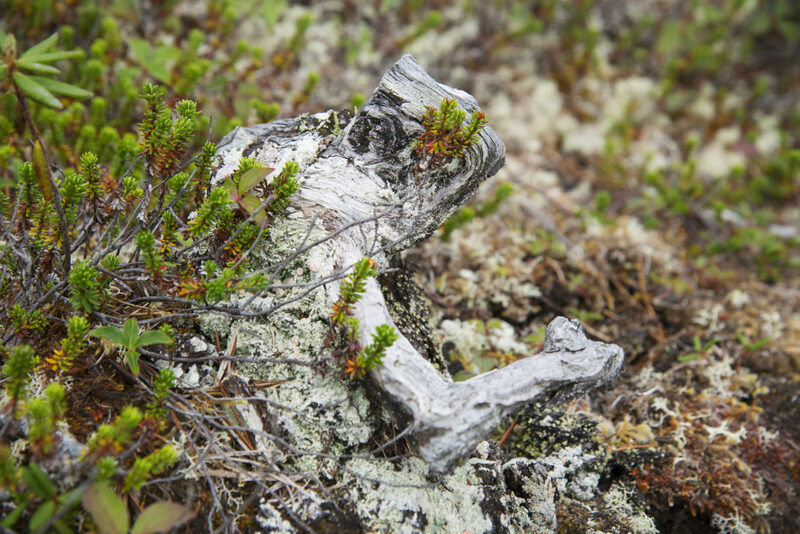 In this image, coastal reindeer lichen, a characteristic bog species, is contrasted against a hillock of sphagnum. False lily of the valley pokes up from a twisted chunk of dead wood. Decaying trees don’t provide a significant amount of nutrients for growing plants, says Andy MacKinnon, “however they can provide moisture and, probably most of all, a bit of elevation around surrounding vegetation,” which gives new plants a boost. One of the most unique characteristics of coastal bogs in the British Columbia-Southeast Alaska region is that they even occur on slopes—some as steep as 60 percent. “Almost everywhere else in the world, bogs only occur on flat ground,” says Andy MacKinnon. 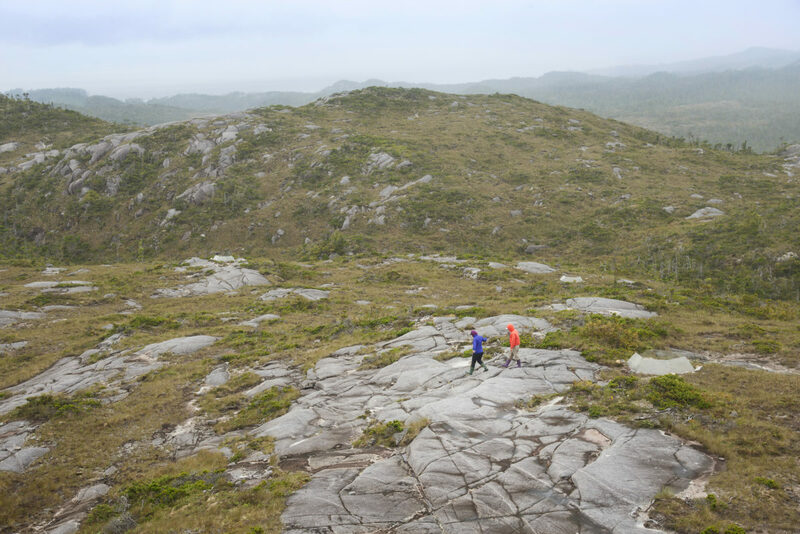 Community ecologist Nancy Shackelford from the University of Victoria and research assistant Kelly Fretwell cross a shallow minerotrophic blanket bog to check on an experiment. The unusual bog type can be crispy dry without precipitation, but is quickly saturated when it rains. Minerotrophic bogs form only small amounts of peat (or none), from a combination of sedge and sphagnum. Standing dead trees are ubiquitous in some bog areas. “In my experience, these trees usually die when drainage changes and the roots … find themselves submerged, where they die from lack of oxygen,” explains Andy MacKinnon. They can remain intact and upright for decades. Ecologist Andrew Trant muses that these old tree bones might resist decay because the grain in their wood is incredibly tight, which might limit the amount of water that can enter and create rot. 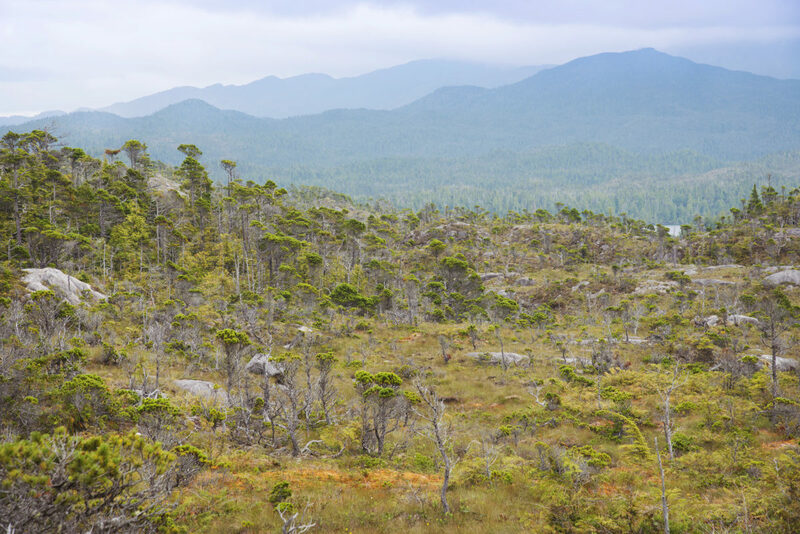 On Calvert Island, the landscape is often a mosaic of bog, bog woodland, and bog forest, as in this example. 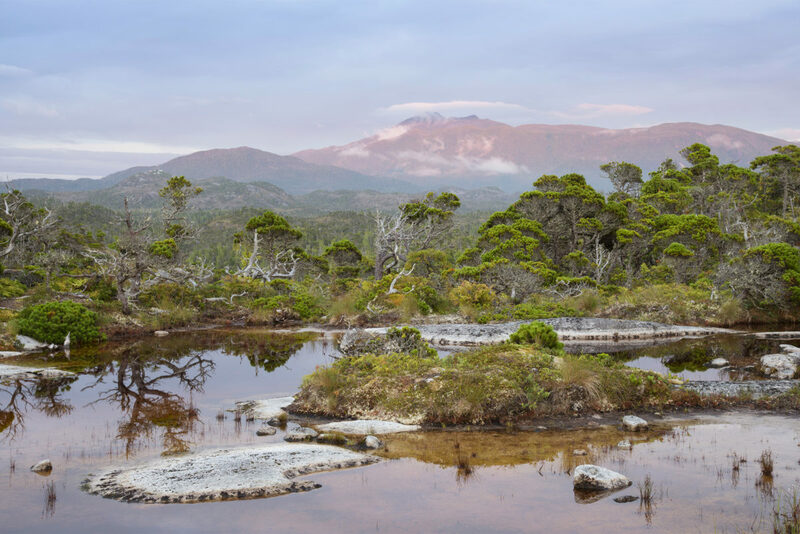 Paleoecological evidence suggests that in this region, bog tends to gradually overtake forest and represents the “climax” state of the ecosystem; though in some areas, the landscape has likely oscillated over time between forest and bog. 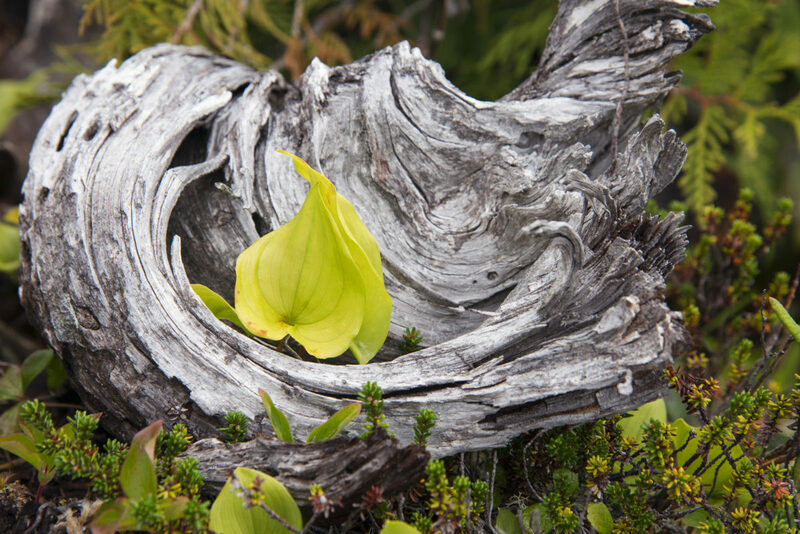 If climate change warms the coastal region around Calvert Island by about 1 °C within a decade, as predicted, it may lead to changes in the bog plant communities. Andrew Trant has been investigating this question since 2012, using open-top, Plexiglas domes to raise the temperature of small plots of bogland during the growing season. The experiment is ongoing, so results are too preliminary to draw any conclusions. In this image, dainty white beak-rush, a species of sedge, blooms in wet soil. Sphagnum moss continuously grows on top of itself, piling meters high in places. Andy MacKinnon suggests that sphagnum may occupy more of the Earth’s surface than any other plant. Perhaps 100 species exist worldwide, though they are difficult to identify without a microscope. Ecologists guess that 30 of them might be found on Calvert Island. 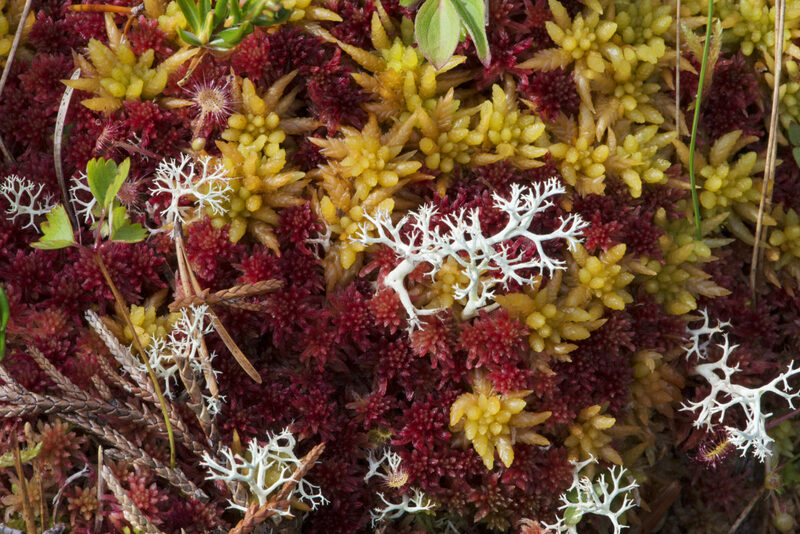 Sphagnum, among other bog species, was useful for early First Nations communities. “Peat mosses were used for cleaning and treating wounds, and general wiping duties—sort of like paper towels,” says MacKinnon. In this image, sprouts of bunchberry accent a deep bank of sphagnum. The coastal bog is “not the Serengeti,” as Ian Giesbrecht admits, though it does provide important nesting habitat for sandhill cranes and is home to many arthropods, such as dragonflies. 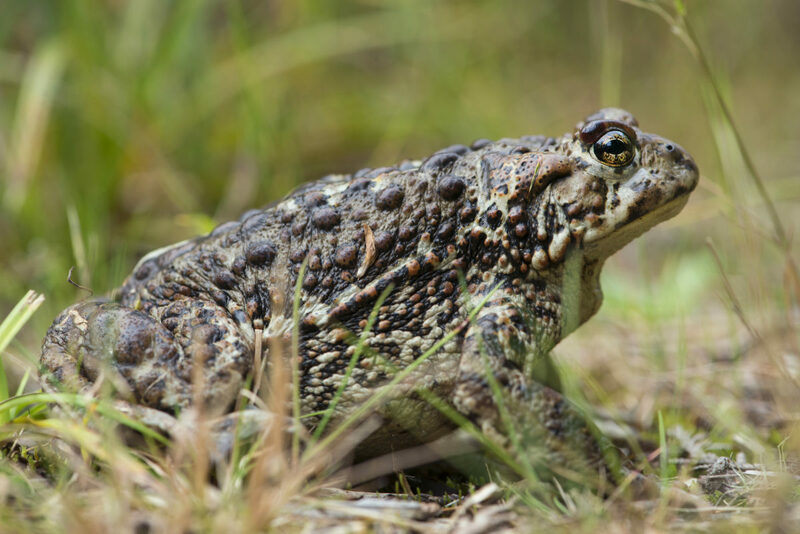 It’s also frequented by animals such as wolves and the western toad shown here. Nancy Shackelford (left) analyzes a plot, with assistance from Kelly Fretwell, at her experimental site. Shackelford’s work considers if the way a bog under stress (in this case, caused by artificially imposed drought) responds to discrete disturbance, such as trampling, could be an early warning signal that it’s about to “collapse” and transition to forest. While setting up the experiment, Shackelford filled a boot with concrete and then systematically trampled small plots of bog to simulate 300 footsteps. Three years later, grasses and mosses have recovered, but lichens and woody shrub species that broke easily are struggling to come back. 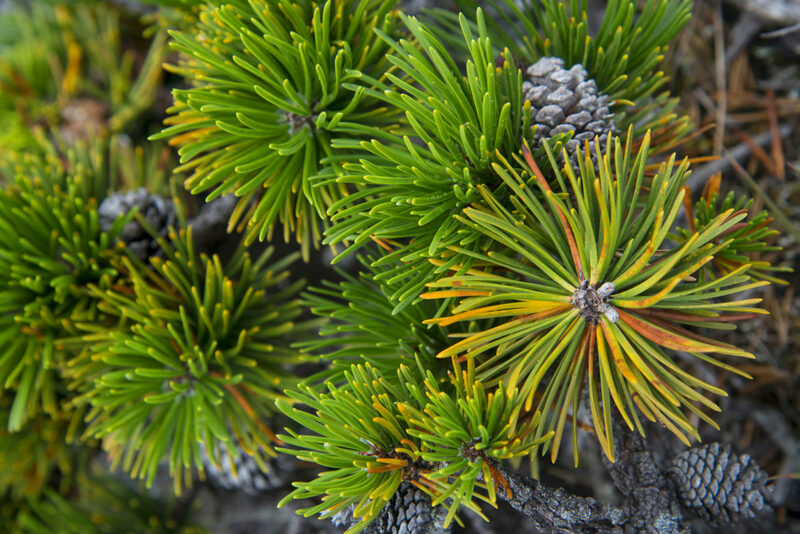 Shore pine, a coastal variety of lodgepole pine, is widespread in coastal bogs. As Andy MacKinnon explains, because the water table sits near the soil’s surface in a bog, trees develop only very short roots—up to roughly 10 centimeters. Ecologists suspect there used to be a small lake where this picturesque bog sits today. Gradually, it filled with peat, forming a deposit now estimated to be more than two meters deep. * The Hakai Institute and Hakai Magazine are both part of the Tula Foundation. The magazine is editorially independent of the institute and foundation. Cite this Article: Shanna Baker “The Secret World of Bog,” Hakai Magazine, Sep 19, 2016, accessed April 23rd, 2019, https://www.hakaimagazine.com/videos-visuals/secret-world-bog/. A little bit algae, a little bit rock, and a lot animal. If you’ve ever wondered about the life of a coral, this photo essay will help. A story in pictures about an iconic and culturally important ecosystem in evolution.